The web has created an insatiable need for all kinds of compelling content. With this in mind you can make money using this product to create everything from dating videos to compelling advertizing content. 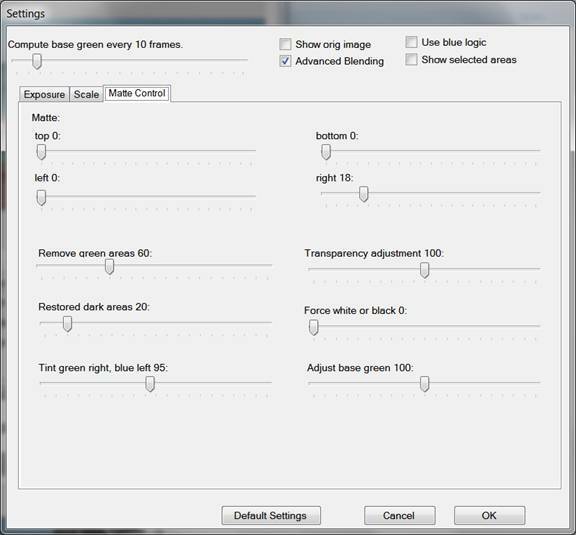 Green Screen Wizard is powerful green screen software for photographers that is inexpensive and simple to use. The Green Screen Zipper follows in that tradition by offering a similar solution for people seeking a green screen video solution. The Green Screen Zipper will take a video shot against a green screen and replace the green in the movie with scenes from another movie or a background image. 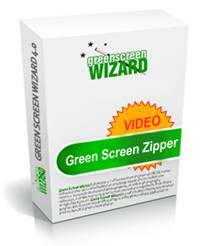 The Green Screen Zipper is a self-contained chroma key video removal program. It requires the free .net 2.0 and the the latest free version of Apple’s Quick Time be installed on your computer. Click here to create a custom package. Green Screen Zipper offers a simple, intuitive user interface that makes it easy to learn, easy to use, and fun for all ages and skill levels. 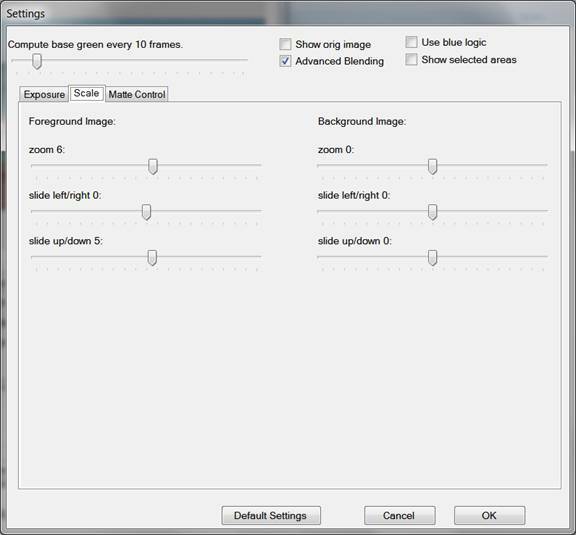 To use the Green Screen Zipper all you need to do is select a foreground “Green Screen Video” and a background video or image and then click Zip ’em and the Green Screen Zipper will zip the two together into a single composited video! You can encode the output video in two formats. The top zip’em button will have the resolution of the foreground video. For faster encoding the second zip’em button will always encode the video in the 470x264 size for a fixed resolution that works well for the web. The system uses the new H263 codec and produces high quality Mpeg4 output. The Overlay button will let you place a still overlay on top of the video. This can make people seem to be inside something like a crystal ball or maybe just a fancy frame. 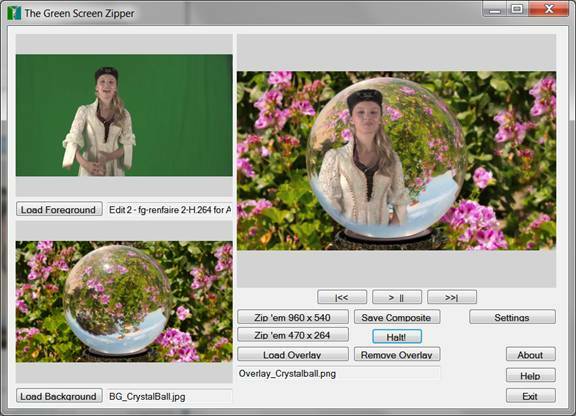 The Green Screen Zipper uses the same proven powerful green screen removal engine used it the Green Screen Wizard package. A great deal of control is given to the Green Screen removal process. 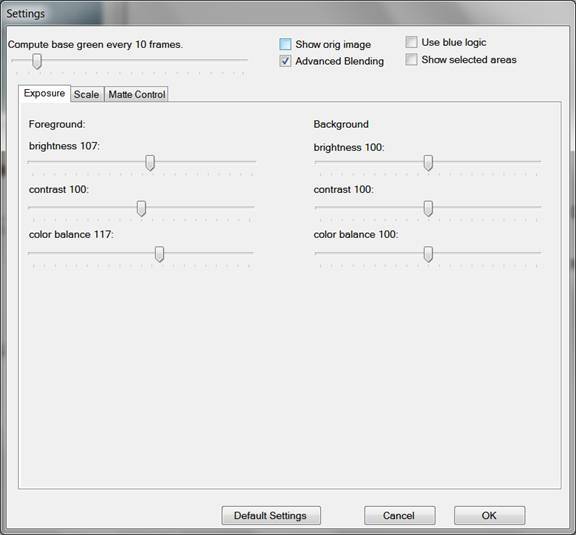 Controls are also supplied to match foreground and background brightness, contrast and white balance. The “Use Blue Logic” check button will process videos shot on a blue screen. Why Buy the Green Screen Zipper? An instructional aid for teachers: Teach a class on Rome, Greece, or maybe the Wild West? Create a video of your student in various locations. Great for creating Web Content: Realtors can talk about the latest housing buys as the homes are shown in the background. These videos are intended to be used as background videos for the Green Screen Zipper. They are all Hi Definition MPeg 4 videos that are at least 2 minutes long. A YouTube preview video is available for each selection. As the Green Screen Zipper takes its sound for the foreground video, most of the videos have no sound.